Porsche's GT3 RS provides the basis for homologation of the 911 GT3 race cars for Porsche Supercup and Carrera Cup championships throughout the world. It is a showcase of Porsche’s road-and-race know-how, and hence a most endearing creature to enthusiasts in that it is essentially a race car for the road. Next year's model will bring increased engine power, reduced weight, slicker gearbox ratios and upgraded body and suspension changes when it goes on sale early in 2010. 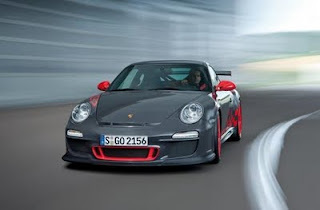 The uncompromising GT3 RS uses the new 3.8-liter naturally-aspirated engine of its junior brother, the GT3. However, in the RS version, the power is greater and revs and acceleration are even faster. The new 911 GT3 RS produces 331 kW of power – 11 kW more than the standard GT3 and 26 kW more than the previous generation GT3 RS. The new 911 GT3 RS’s specific output of 87 kW per liter (118 hp) from the boxer six-cylinder engine makes it unique in the world of naturally aspirated engines. Unlike many other high-performance engines, the engine in the new GT3 RS remains fully suitable for everyday use. The new 911 GT3 RS comes exclusively with a short-shifting, six-speed manual gearbox optimized on this occasion with shorter gear ratios than on the regular GT3 for even more rapid acceleration. A specially developed Porsche Active Suspension Management (PASM) system is also fitted to the GT3 RS. PASM, together with wider front and rear tracks, allows for even greater cornering grip. The front axle comes with nine-inch-wide wheels running on 245/35 ZR 19 sports tires, the rear axle features twelve-inch-wide wheels incorporating 325/30 ZR 19 sports tires. These wheels are housed in wider wheel arch covers. New dynamic engine mounts are standard and improve the car’s already superior driving prowess by altering the stiffness and damping between engine and body when the RS is driven hard on the road or race track. 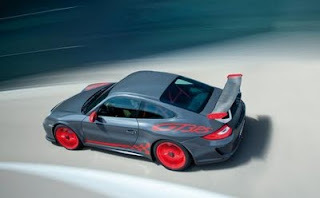 The RS’s aerodynamics are also taken to next level with even more downforce than on the standard GT3. The built-for-racing philosophy is further underlined with the option of a lithium-ion battery, reducing weight by more than 10 kg over a conventional lead battery. The new 911 GT3 RS shows its close connection to motorsport through its body design and stance. It rides lower and is easily identified by its extra-large carbon-fiber rear wing with specifically designed aluminum wing supports. Dual tailpipes for the extra-light titanium sports exhaust as well as special front and rear styling touches are also exclusive to this model. Pricing for the new 911 GT3 RS will be announced closer to the car’s on-sale date.